Much evidence implicates IL-8 as a major mediator of inflammation and joint destruction in rheumatoid arthritis. The effects of IL-8 and its related ligands are mediated via two receptors, CXCR1 and CXCR2. In the present study, we demonstrate that a potent and selective nonpeptide antagonist of human CXCR2 potently inhibits 125I-labeled human IL-8 binding to, and human IL-8-induced calcium mobilization mediated by, rabbit CXCR2 (IC50 = 40.5 and 7.7 nM, respectively), but not rabbit CXCR1 (IC50 = >1000 and 2200 nM, respectively). These data suggest that the rabbit is an appropriate species in which to examine the anti-inflammatory effects of a human CXCR2-selective antagonist. In two acute models of arthritis in the rabbit induced by knee joint injection of human IL-8 or LPS, and a chronic Ag (OVA)-induced arthritis model, administration of the antagonist at 25 mg/kg by mouth twice a day significantly reduced synovial fluid neutrophils, monocytes, and lymphocytes. In addition, in the more robust LPS- and OVA-induced arthritis models, which were characterized by increased levels of proinflammatory mediators in the synovial fluid, TNF-α, IL-8, PGE2, leukotriene B4, and leukotriene C4 levels were significantly reduced, as was erythrocyte sedimentation rate, possibly as a result of the observed decreases in serum TNF-α and IL-8 levels. In vitro, the antagonist potently inhibited human IL-8-induced chemotaxis of rabbit neutrophils (IC50 = 0.75 nM), suggesting that inhibition of leukocyte migration into the knee joint is a likely mechanism by which the CXCR2 antagonist modulates disease. Chemokines are low m.w. proteins that modulate the immune response through the chemoattraction and activation of leukocytes. These mediators are divided into four classes based on the positions of the N-terminal cysteine residues within the protein. Chemokines in which the first two cysteines are separated by a single, nonconserved amino acid are designated CXC or α chemokines, while those containing adjacent N-terminal cysteine residues are CC or β chemokines. The C or γ class is characterized by one N-terminal cysteine residue, and to date consists of a single chemokine, lymphotactin. Similarly, the CXXXC or δ class, in which the two N-terminal cysteines are separated by three amino acids, is represented solely by fractalkine (1, 2). The CXC chemokines can be further divided into the glutamic acid-leucine-arginine (ELR+)3 and ELR− subclasses, based on the presence or absence of the ELR motif before the first N-terminal cysteine. The ELR+ CXC chemokines chemoattract and activate neutrophils, while the ELR− CXC chemokines do not (2, 3). The human ELR+ family consists of IL-8 (CXCL8), growth-related oncogene (GRO)-α (CXCL1), GRO-β (CXCL2), GRO-γ (CXCL3), epithelial all-derived neutrophil-activating peptide-78 (ENA-78) (CXCL5), granulocyte chemotactic protein-2 (CXCL6), and neutrophil-activating peptide-2 (CXCL7), all of which bind to the human IL-8RB, CXCR2 (4), with high affinity (low nanomolar Kd); in contrast, only IL-8 binds to the human IL-8RA, CXCR1 (5), with high affinity (6, 7). Interestingly, like IL-8, but distinct from the other ELR+ chemokines, granulocyte chemotactic protein-2 mediates the activation of CXCR1 and displaces 125I-labeled IL-8 (125I-IL-8) from this receptor, although with lower potency than does IL-8 (7). IL-8, GRO-α, and ENA-78 are major mediators of inflammation and joint destruction in rheumatoid arthritis (RA). Elevated levels of IL-8, GRO-α, and ENA-78 were detected in the synovial tissue and fluid of RA patients compared with osteoarthritis patients (8, 9, 10, 11) and in the peripheral blood of RA patients compared with normal volunteers (8, 10, 11). Spontaneous and LPS-induced expression of IL-8 by PBMC was found to be significantly higher in cells derived from RA patients than in cells derived from normal volunteers (12, 13). Furthermore, serum levels of IL-8-specific autoantibodies have been shown to correlate with levels of C reactive protein (a measure of disease severity) and the number of arthritic joints in RA patients (14). Additional evidence for the involvement of IL-8 in the pathophysiology of RA comes from the fact that numerous antirheumatic drugs have been shown to inhibit IL-8 expression and/or activity in vivo and in vitro (12, 15, 16, 17, 18). That induction of cell migration is a primary mechanism by which the ELR+ chemokines modulate RA is suggested by the finding that neutralizing IL-8-, GRO-α-, and ENA-78-specific Abs significantly inhibited RA synovial fluid chemotactic activity for neutrophils (8, 10, 11). Additional mechanisms, including the stimulation of mediator release by cells, are implicated by the finding that coculture of cartilage, neutrophils, and human IL-8 resulted in cartilage degradation mediated by IL-8-induced neutrophil degranulation (19). In contrast to mice, rabbits express homologs of both CXCR1 (20, 21) and CXCR2 (22). In addition, rabbit homologs of IL-8 (23, 24) and GRO (25, 26, 27) have been identified, and shown to play a central role in rabbit models of RA. Specifically, injection of rabbit IL-8 into rabbit knee joint cavities induced massive neutrophil accumulation, the release of neutrophil elastase resulting in cartilage destruction, and the induction of IL-1β and IL-1R antagonist expression (28). In acute arthritis induced by rabbit knee joint injection of LPS or monosodium urate crystals, IL-8 levels in synovial fluid and tissue were significantly elevated before the influx of leukocytes (primarily neutrophils) (29, 30). A neutralizing IL-8-specific Ab was shown to inhibit LPS-, monosodium urate crystal-, or IL-1α-induced leukocyte infiltration into rabbit knee joints, as well as to protect from joint swelling and tissue damage (30, 31). Similarly, in LPS-induced rabbit arthritis, elevated synovial fluid GRO levels preceded knee joint leukocyte influx, which was inhibited 54% by a neutralizing GRO-specific Ab, 48% by anti-IL-8 IgG, and 70% by a combination of the two Ab specificities (32). Based on the similarities between the human and rabbit ELR+ systems and the strong rationale for the involvement of the ELR+ chemokines/chemokine receptors in both human and rabbit RA, we initiated studies to determine the effect of a nonpeptide antagonist of human CXCR2 in acute and chronic models of RA in the rabbit. Human IL-8 was expressed and purified in Department of Protein Biochemistry (GlaxoSmithKline, King of Prussia, PA). Rat CINC-1, rat GRO-β, and human C5a were purchased from R&D Systems (Minneapolis, MN), Genzyme Diagnostics (Cambridge, MA), and Sigma-Aldrich (St. Louis, MO), respectively. N-(3-(aminosulfonyl)-4-chloro-2-hydroxyphenyl)-N′-(2,3-dichlorophenyl) urea was synthesized as described in the International Application published under the Patent Cooperation Treaty. Total RNA was prepared using cell pellets of the neutrophil-rich bronchoalveolar lavage fluid from rabbits 4 h after treatment with Escherichi coli (33), and reverse transcribed using methods described previously (34). Oligonucleotide primers for PCR amplification were designed from published sequences to include either the native or a consensus start recognition site (35, 36) and the entire open reading frame sequences (rCXCR1, GenBank accession no. M74240; Ref. 21 ; rCXCR2, GenBank accession no. L24445; Ref. 22). Primers synthesized for rCXCR1 were upstream 5′-GCC ACC ATG GAA GTA AAC GTA TGG-3′ and reverse was 5′-TTA GAG ATT TGA AGG CAC GTT GGT AGA GG-3′, and the primers for rCXCR2 were upstream 5′-TAT CTC AGA AAT GCA AGA GTT TAC CTG GG-3′ and reverse was 5′-CTG CAG CCC ACA TAG GCG TCT TAG AGG-3′. The DNA fragments were amplified using the PFU polymerase (Stratagene, La Jolla, CA). PCR amplicons were blunt-end ligated into the plasmid vector pCR2.1 (Invitrogen, Carlsbad, CA) for sequencing. Inserts were excised with KpnI and XhoI and ligated into the mammalian expression vector pMEP4 (Invitrogen) prepared with the same restriction enzymes. Baby hamster kidney (BHK)-570 cells were transfected by electroporation, and positive transfectants were selected by hygromycin resistance. BHK cells were also transfected with pMEP4 vector only (no insert). Single colonies (∼50) were “picked” and receptor expression was screened by 125I-labeled human IL-8 (125I-human IL-8) binding competition and the highest expressing clones used for further studies. DNA sequencing of the rCXCR1 PCR product showed 100% identity with the published sequence (21). For rCXCR2, several silent mutations were obtained along with three expressed mutations compared with the published sequence (22), i.e., T-759-G (Val to Gly) in transmembrane domain-5, A-881-G (Thr to Ala) in transmembrane domain-6, at the junction with extracellular loop-3, and A-1059-G, C-1060-A (His to Arg) in the C-terminal tail of the receptor. Based on our demonstration of binding and calcium mobilization in response to ligand stimulation, these mutations do not appear to affect receptor function. BHK-570-rCXCR1 and BHK-570-rCXCR2 cell membranes were prepared as detailed previously (37). Assays were performed in 96-well microtiter plates where the reaction mixture contained membrane protein in 20 mM bis-Trispropane (pH 8.0), 1.2 mM MgSO4, 0.1 mM EDTA, 25 mM NaCl, 0.03% CHAPS, and compound (10 mM stock in DMSO) added at the indicated concentrations. The final DMSO concentration was <1% under standard binding conditions, and did not affect 125I-human IL-8 binding to rCXCR1 or rCXCR2. Binding was initiated by the addition of 0.15 nM 125I-human IL-8 (2200 Ci/mmol; Amersham Pharmacia Biotech, Piscataway, NJ). After a 1-h incubation at room temperature, the plate was harvested using a Packard Filtermate 96-well harvester (Packard Instrument, Meriden, CA) through Packard GF/C filters that were presoaked for 30 min with 0.5% polyethylenimine. Filter plates were washed with 10 ml of ice-cold buffer containing 250 mM NaCl and 20 mM Tris-HCl, pH 7.4, and then were dried. Microscint-20 (50 μl) was added to each well and the radioactivty counted in a Packard Topcount scintillation counter (Packard Instrument). Concentration-response curves for each compound were performed using duplicate samples in at least three independent experiments. Specific binding was determined by subtracting nonspecific binding, i.e., binding in the presence of 100 nM cold human IL-8, from the total binding. Calcium mobilization studies were conducted using Fluo 3-loaded BHK-570-rCXCR1 and BHK-570-rCXCR2 cells and a microtiter plate-based assay, using a fluorescent imaging plate reader (Molecular Devices, Sunnyvale, CA) (38). BHK-570-rCXCR1 and BHK-570-rCXCR2 cells were grown to 80% confluence in DMEM with high glucose, 10% FCS, 10 mM HEPES, 2 mM l-glutamine, and 800 μg/ml of Hygromycin-B. The cells were harvested and plated in 96-well black wall/clear bottom plates (Packard view plate; Packard Instrument) at ∼40,000 cells/well and grown in a CO2 incubator for 18–24 h. On the day of assay, growth media was aspirated and replaced with fresh media without FCS, with 0.1% BSA, 4 μM Fluo-3AM fluorescent indicator dye (Molecular Probes, Eugene, OR), and 2.5 mM probenecid. Plates were incubated for 1 h (37°C, 5% CO2), media was aspirated and replaced with the same media without Fluo-3, and incubated for an additional 10 min. Cells were washed three times with Krebs Ringer Henseleit buffer (120 mM NaCl, 4.6 mM KCl, 1.03 mM KH2PO4, 25 mM NaHCO3, 1.0 mM CaCl2, 1.1 mM MgCl2, 11 mM glucose, 20 mM HEPES, pH 7.4) with 2.5 mM probenecid and 0.1% gelatin. Fresh buffer (100 μl/well) was added, the cells incubated at 37°C for 10 min, and the plates placed into a fluorescent imaging plate reader for analysis. At the initiation of the experiment, fluorescence was read every 1 s for 1 min and then every 3 s for the following minute. 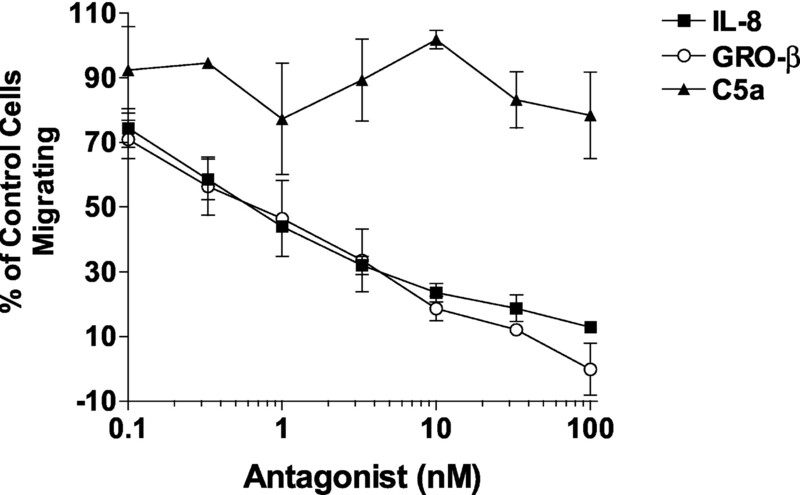 Agonist (human IL-8 or rat cytokine-induced neutrophil chemoattractant (CINC)-1) was added after 10 s and concentration-response curves were obtained by calculating the maximal fluorescent counts above background after addition of each concentration of agonist. The EC50 is the concentration of agonist producing 50% of the maximal human IL-8- or rat CINC-1-induced response. The percentage of maximal human IL-8-induced Ca2+ mobilization induced by 1 nM human IL-8 for rCXCR1 or 10 nM human IL-8 for rCXCR2 was determined for each concentration of antagonist and the IC50 calculated as the concentration of test compound that inhibits 50% of the maximal response induced by human IL-8. Adult female New Zealand White rabbits (H.A.R.E. Rabbitry, Hewitt, NJ) (3.0–4.0 kg) were anesthetized with ketamine and xylazine (35 and 5 mg/kg, respectively, injected i.m. ), and administered 5 μg of human IL-8 in 100 μl of PBS into the right knee joint, and as a control, 100 μl of PBS into the left knee joint. One hour before and 4 h following IL-8 administration, rabbits (n = 3) were dosed by mouth (p.o.) with the CXCR2 antagonist (25 mg/kg) or with vehicle (50% polyethylene glycol (PEG) 400 at 2.5 ml/kg). Twenty four hours following IL-8 administration, rabbits were euthanized by i.v. injection of 1 ml of sodium pentobarbitol. Ice-cold PBS (1.2 ml) was then injected into each knee joint, the knee joint flexed several times, and the synovial fluid removed. Total cell counts were performed on the synovial fluids, as well as differential cell analyses using Wright-Giemsa stain. In addition, synovial fluids were centrifuged at 1300 × g for 10 min and supernatants collected for measurement of eicosanoids and cytokines. Anesthetized rabbits were administered 10 ng of LPS (from E. coli Serotype 026:B6; Sigma-Aldrich) in 100 μl of PBS into the right knee joint, and 100 μl of PBS into the left knee joint. Two hours before and 2 h following LPS administration, rabbits (n = 5) were dosed p.o. with the CXCR2 antagonist (25 mg/kg) or with vehicle (50% PEG 400 at 2.5 ml/kg). Blood concentrations of the antagonist, measured in samples from two rabbits by mass spectrometry, ranged from 0.32 and 0.44 μM at 2.75 h post-LPS injection to 1.7 and 2.57 μM at 5.3 h, respectively; at the termination of the study (16 h), concentrations were 1.05 and 0.71 μM, respectively. Sixteen hours following LPS administration, rabbits were euthanized, and synovial fluids collected for total cell counts, differential cell analyses, and measurement of eicosanoids and cytokines. Before the initiation of compound administration (prebleeds), and 0.75, 4, and 16 h following LPS administration, blood samples were collected and serum cytokine concentrations determined. In addition, prebleed and 16 h blood samples were used to determine erythrocyte sedimentation rate (ESR) by the Westergren method (39). Anesthetized rabbits were sensitized by s.c. administration of 10 mg of OVA (Sigma-Aldrich) in 2 ml of CFA (Sigma-Aldrich) (40 μl injections at 50 sites on the back), and boosted at 3- to 4-wk intervals by interscapular administration of 10 mg of OVA in 0.5 ml of IFA (Sigma-Aldrich). After four to five boosts rabbits were skin tested by intradermal injection of 10 μg of OVA in 100 μl of PBS. Rabbits exhibiting a welt of 14 mm or greater after 24–48 h were placed in treatment groups, and on day 0 anesthetized, and administered 10 mg of OVA in 100 μl of PBS into the right knee joint, and 100 μl of PBS into the left knee joint. On days 0–14, rabbits (n = 5) were dosed p.o., twice a day (b.i.d.) with the CXCR2 antagonist (25 or 10 mg/kg) or with vehicle (10% PEG 400 at 2.5 ml/kg). On day 15, rabbits were euthanized, and synovial fluids collected for total cell counts, differential cell analyses, and measurement of eicosanoids and cytokines. In addition, on days 0 and 15, knee diameters were measured. 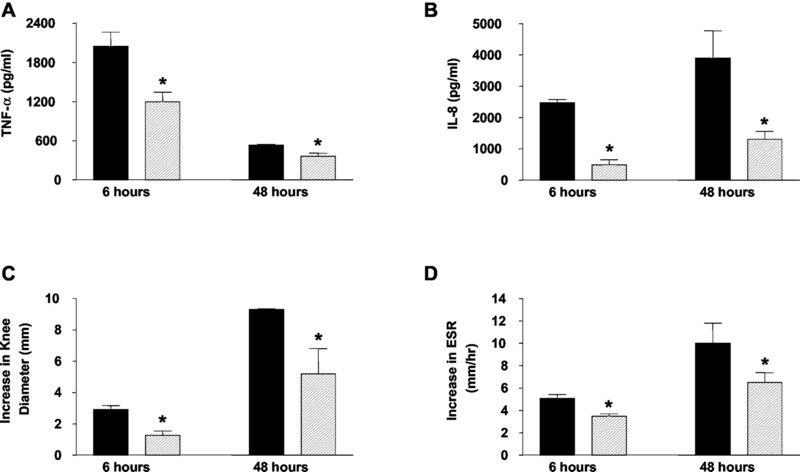 To measure the effects of CXCR2 antagonism on TNF-α levels and ESR, which peak within 6–48 h following OVA injection into the knee joint (see Fig. 7⇓A) (40), rabbits (n = 5) were sensitized, boosted and skin tested as described above, and then administered the CXCR2 antagonist (25 mg/kg) or vehicle (10% PEG 400 at 2.5 ml/kg) p.o., b.i.d. on day −1, and once a day on day 0, immediately before OVA or PBS injection into knee joints. Before the initiation of compound administration and 6 h following knee joint injection, blood samples were collected for measurement of ESR, and knee diameters were measured. Six hours following knee joint injection, synovial fluids were collected for TNF-α and IL-8 measurement. To examine a 48-h time point, rabbits (n = 5) were dosed p.o., b.i.d. with the antagonist (25 mg/kg) or with vehicle (10% PEG 400 at 2.5 ml/kg) beginning on day 0, and synovial fluids and final blood samples collected 48 h after knee joint injection (e.g., at the beginning of day 2). Synovial fluids were assayed for eicosanoid content using the PGE2 EIA kit, the Leukotriene (LT) B4 EIA kit, and the LTC4 EIA kit (Cayman Chemicals, Ann Arbor, MI). TNF-α and IL-8 levels were measured using rabbit TNF-α-specific polyclonal Abs and the Rabbit OptEIA ELISA kit, respectively (BD PharMingen, San Diego, CA). The assays were performed following the recommended protocol of the manufacturers. Knee diameters (anterior to posterior) were measured using calipers. For each knee, three measurements were taken and the values averaged. Rabbit neutrophils were isolated from whole blood, with all buffers used and procedures performed at room temperature. Heparinized blood (40 ml) was diluted with an equal volume of PBS (without Ca2+ and Mg2+), and 20 ml of diluted blood layered over 15 ml of Accu-Paque (Accurate Chemical, Westbury, NY). Following centrifugation at 400 × g for 25 min, the granulocyte/RBC fraction was resuspended in 35 ml of PBS plus 12.5 ml of 6% dextran in PBS, and incubated at room temperature for 25 min to allow RBCs to sediment. Supernatants were collected, centrifuged at 200 × g for 8 min, and each pellet resuspended in 1 ml of PBS. To lyse residual RBC, each pellet was incubated in 18 ml of water for 30 s, and then 2 ml of 10× PBS were added, followed by 29 ml of 1× PBS. After centrifugation at 200 × g for 8 min, pellets were pooled in 10 ml of PBS, and cell counts performed. Cells were then washed in a total of 50 ml of PBS. Purity of the neutrophil population was 95%, as determined by differential cell analysis. Rabbit neutrophils were washed in PBS and then resuspended in PBS containing 1 mM MgCl2 and 1 mM CaCl2. Chemotaxis assays were performed using a modified Boyden chamber as previously described (41). Briefly, a 3-micron sparse-pore polycarbonate (Nucleopore) membrane (NeuroProbe, Gaithersburg, MD) was washed for 20 min in ethanol, and air dried before use. Lower chambers were filled with 30 μl of human IL-8 (10 nM), rat GRO-β (100 nM), or human C5a (100 nM) (chemokine concentrations used were those which induce 75% of the maximal chemotactic response, as determined in previous experiments). The empty upper chambers were then lowered into place, and 50 μl of neutrophil suspension (5 × 106 cells/ml) containing vehicle, or the CXCR2 antagonist at the indicated concentrations (performed in triplicate), were added. Following incubation at 37°C for 60 min, the chamber was disassembled, the membrane fixed in 75% methanol, and then stained using using the Diff-Quick system (Baxter Diagnostics, McGaw Park, IL). Migrated cells were counted in three high powered fields per well, and the values totaled to give the number of cells migrated per well. Mean values for triplicate wells were calculated, and percentage of control cells, i.e., activity in the absence of antagonist, determined. The mean IC50 ± SEM was determined from three individual experiments. Statistical significance was determined using the two-tailed Student’s t test. Values of p < 0.05 were considered significant. N-(3-(aminosulfonyl)-4-chloro-2-hydroxyphenyl)-N′-(2,3-dichloro-phenyl) urea (Fig. 1⇓) is a potent, selective antagonist of human CXCR2. It has been shown to compete with 125I-human IL-8 for binding to human recombinant CXCR2 (expressed on Chinese hamster ovary cell membranes) with an IC50 of 9.3 ± 0.8 nM (n = 7), while its affinity for human recombinant CXCR1 is three orders of magnitude lower (IC50 = 9, 633 ± 892 nM (n = 3)) (methods described in Ref. 42). 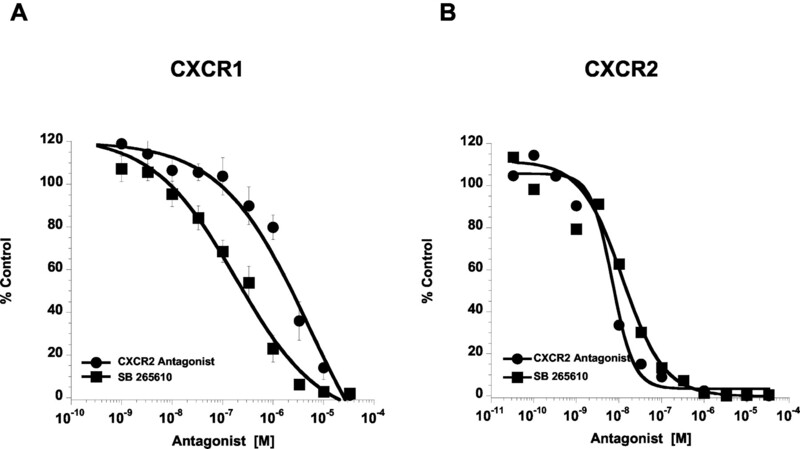 The selectivity of the compound for human CXCR2 is further supported by its failure to compete for ligand-binding to other human chemokine receptors, including CXCR3, CXCR4, CCR2, CCR7, CCR8, and CX3CR1, as well as its lack of activity in 66 additional receptor binding and enzyme assays previously described (43). The chemical structure of the CXCR2 antagonist, N-(3-(aminosulfonyl)-4-chloro-2-hydroxyphenyl)-N′-(2,3-dichlorophenyl) urea. Rabbits, like humans, express both CXCR1 and CXCR2 on peripheral blood neutrophils. To determine whether the potency and selectivity of the antagonist in the rabbit is representative of that in man, rCXCR1 and rCXCR2 were cloned and stably expressed in BHK-570 cells, resulting in the generation of BHK-570-rCXCR1 and BHK-570-rCXCR2 cells, respectively. Human IL-8 was a potent inducer of calcium mobilization mediated by CXCR1 (EC50 = 0.6 nM) (Fig. 2⇓A) and CXCR2 (EC50 = 2.3 nM) (Fig. 2⇓B), while rat CINC-1, a homolog of human GRO (44, 45), potently induced CXCR2-mediated, but not CXCR1-mediated, calcium mobilization (EC50 = 8.6 nM and >1000 nM, respectively) (Fig. 2⇓). Interestingly, the human receptors responded similarly to these chemokines, with human IL-8 and rat CINC-1 inducing human CXCR2-mediated calcium mobilization with comparable potencies, while IL-8 but not CINC-1 induced human CXCR1-mediated calcium mobilization (data not shown). Calcium mobilization in BHK-570-rCXCR1 and BHK-570-rCXCR2 cells in response to human IL-8 or rat CINC-1. BHK-570-rCXCR1 cells (A) and BHK-570-rCXCR2 cells (B) were loaded with Fluo 3 and stimulated with increasing concentrations of human IL-8 (•) or rat CINC-1 (▪), and the maximal calcium level achieved was determined as described in Materials and Methods. The results are expressed as Ca2+ levels (optical units) and are the mean ± SEM of three to four experiments. Consistent with the calcium mobilization data, human IL-8 potently inhibited binding of 125I-human IL-8 to rCXCR1 (IC50 = 0.14 nM; Fig. 3⇓A) and rCXCR2 (IC50 = 0.25 nM; Fig. 3⇓B), while rat CINC-1 was a potent inhibitor of the latter (IC50 = 37.6 nM; Fig. 3⇓B), but not the former (IC50 = >1000 nM; Fig. 3⇓A). The fact that rabbit IL-8, like human IL-8, has been shown to bind to rCXCR1 (46), suggests that human and rabbit IL-8 exhibit comparable pharmacological profiles at the rabbit receptors. Competition binding of 125I-IL-8 to membranes of BHK-570-rCXCR1 and BHK-570-rCXCR2 cells by selected ligands. BHK-570-rCXCR1 membranes (A) and BHK-570-rCXCR2 membranes (B) were incubated with 125I-IL-8 in the absence and presence of human IL-8 (•), rat CINC-1 (▪), the CXCR2 antagonist (♦) or SB 265610 (▴) as described in Materials and Methods. Results are expressed as percentage of control specific binding and are the mean ± SEM for three to four experiments performed. The potency and selectivity of the CXCR2 antagonist was assessed using BHK-570-rCXCR1 and BHK-570-rCXCR2 cells. The antagonist inhibited human IL-8-induced calcium mobilization in BHK-570-rCXCR2 cells with an IC50 of 7.7 nM (Fig. 4⇓B), while it inhibited human IL-8-induced calcium mobilization in BHK-570-rCXCR1 with a 285-fold lower potency (IC50 = 2200 nM; Fig. 4⇓A)). A second human CXCR2-selective compound, SB 265610 (47), also exhibited greater inhibitory potency on CXCR2-mediated calcium mobilization (IC50 = 16 nM; Fig. 4⇓B) compared with CXCR1-mediated calcium mobilization (IC50 = 250 nM; Fig. 4⇓A), although the difference in potencies for the two receptors was lower in magnitude. Similarly, the CXCR2 antagonist and SB 265610 each inhibited binding of 125I-human IL-8 to rCXCR2 with greater potency (IC50 = 40.5 and 32.2 nM, respectively; Fig. 3⇑B) than binding of 125I-human IL-8 to rCXCR1 (>1000 and ∼1000 nM, respectively; Fig. 3⇑A). Inhibition by the CXCR2 antagonist or SB 265610 of human IL-8-induced calcium mobilization in BHK-570-rCXCR1 and BHK-570-rCXCR2 cells. FLUO 3-loaded BHK-570-rCXCR1 cells (A) and BHK-570-rCXCR2 cells (B) were stimulated with 1 nM human IL-8 after the addition of increasing concentrations of the CXCR2 antagonist (•) or SB 265610 (▪). The results are expressed as a percentage of the maximum Ca2+ levels elicited by 1 nM human IL-8 in the absence of antagonist. Values presented are the mean ± SEM of three experiments for CXCR1 and two experiments for CXCR2. Collectively, these in vitro observations indicate functional similarities between human and rCXCR1/CXCR2, and thus suggest that the rabbit is a relevant species in which to examine the efficacy of a selective CXCR2 antagonist on disease modulation. The in vivo activity of the CXCR2 antagonist was assessed in an acute IL-8-induced joint inflammation model in the rabbit. Rabbits administered the CXCR2 antagonist (25 mg/kg, p.o., b.i.d.) 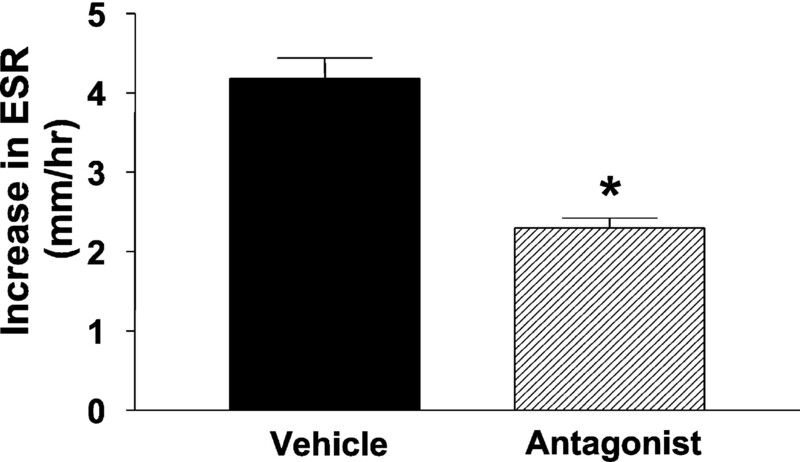 exhibited significantly reduced numbers of total leukocytes in synovial fluids from IL-8-injected knees, compared with rabbits administered vehicle (Fig. 5⇓). This reduction in leukocytes was accounted for by a significant decrease in neutrophils, monocytes, and lymphocytes (Fig. 5⇓). In contrast to synovial fluid leukocyte numbers from IL-8-injected knees, synovial fluid leukocyte numbers from contralateral PBS-injected knees were low or undetectable (data not shown), as was the case in the subsequent rabbit arthritis models described. Levels of eicosanoids (PGE2, LTB4, and LTC4) and cytokines (TNF-α and IL-8) in synovial fluids from IL-8-injected knees were not significantly increased above levels from PBS-injected knees (data not shown), and therefore the effect of CXCR2 antagonism on synovial fluid mediator content was not measurable in this model of joint inflammation. The CXCR2 antagonist inhibits IL-8-induced synovial fluid leukocyte accumulation. One hour before and 4 h following administration of human IL-8 (5 μg) into the right knee joint, rabbits (n = 3) received the CXCR2 antagonist (25 mg/kg) (▨) or vehicle (▪) p.o. Twenty-four hours following IL-8 administration, synovial fluids were collected and differential cell analyses performed. Data are expressed as the mean ± SD. A second acute model of joint inflammation in the rabbit was established using the pleiotropic leukocyte activator, LPS. 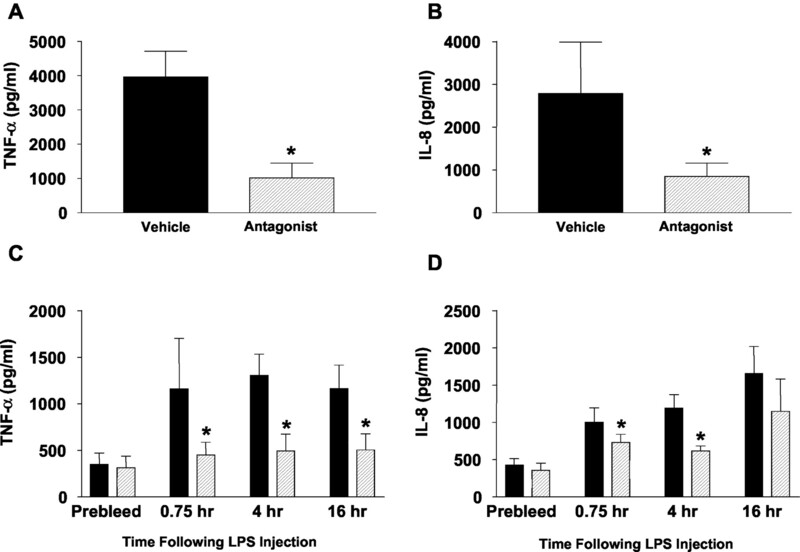 Rabbits receiving a knee joint injection of LPS (10 ng) exhibited a more robust inflammatory response than those injected with human IL-8 (5 μg). Specifically, total synovial fluid leukocyte numbers were 13-fold greater in the LPS-induced arthritis model as compared with the IL-8-induced arthritis model (Figs. 6⇓A and 5, respectively). 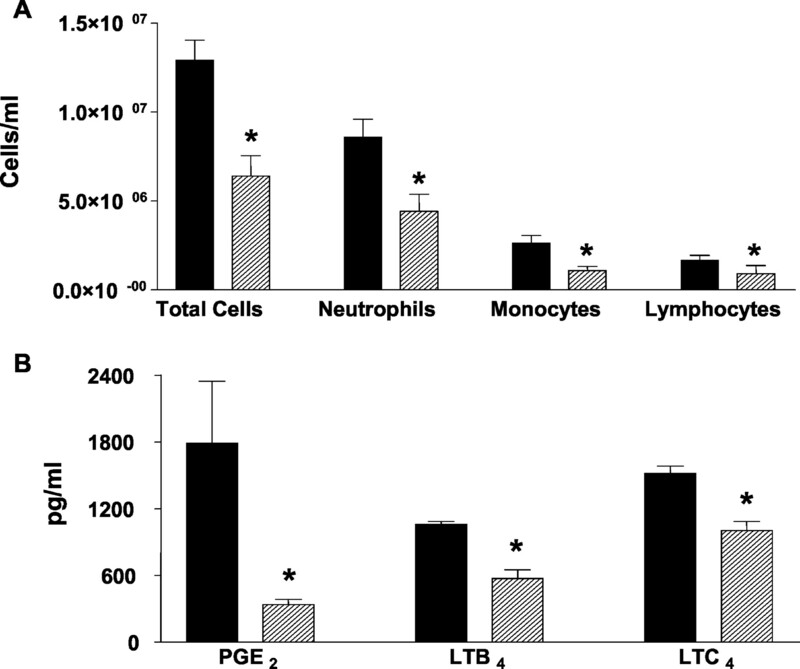 In addition, unlike the IL-8-induced arthritis model, synovial fluid levels of PGE2, LTB4, and LTC4 (Fig. 6⇓B), and TNF-α and IL-8 (Fig. 7⇓, A and B, respectively) from LPS-injected knees were significantly elevated above levels from contralateral PBS-injected knees, which were low or undetectable (data not shown). The CXCR2 antagonist inhibits LPS-induced synovial fluid leukocyte and eicosanoid accumulation. Two hours before and 2 h following administration of LPS (10 ng) into the right knee joint, rabbits (n = 5) received the CXCR2 antagonist (25 mg/kg) (▨) or vehicle (▪) p.o. Sixteen hours following LPS administration, synovial fluids were collected and differential cell analyses (A) and eicosanoid assays (B) performed. Data are expressed as the mean ± SD. The CXCR2 antagonist inhibits LPS-induced TNF-α and IL-8 accumulation in the synovial fluid and the serum. A and B, Two hours before and 2 h following administration of LPS (10 ng) into the right knee joint, rabbits (n = 5) received the CXCR2 antagonist (25 mg/kg) or vehicle p.o. Sixteen hours following LPS administration, synovial fluids were collected and TNF-α and IL-8 assays performed. Data are expressed as the mean ± SD. C and D, Two hours before and 2 h following administration of LPS (10 ng) into the right knee joint, rabbits (n = 5) received the CXCR2 antagonist (25 mg/kg) (▨) or vehicle (▪) p.o. Before the initiation of compound administration, and 0.75, 4, and 16 h following LPS administration, blood samples were collected, serum isolated, and TNF-α and IL-8 assays performed. Data are expressed as the mean ± SD. Rabbits treated with the CXCR2 antagonist (25 mg/kg, p.o., b.i.d.) exhibited significantly reduced numbers of total leukocytes in synovial fluids from LPS-injected knees compared with vehicle-treated rabbits. Differential cell analyses showed that neutrophils, monocytes, and lymphocytes were significantly decreased as a result of compound treatment (Fig. 6⇑A). Administration of the antagonist resulted in significant reductions in synovial fluid PGE2, LTB4, and LTC4 levels (Fig. 6⇑B), as well as in synovial fluid TNF-α (Fig. 7⇑A) and IL-8 content (Fig. 7⇑B). Serum levels of TNF-α (Fig. 7⇑C) and IL-8 (Fig. 7⇑D), which were elevated following LPS administration, were significantly decreased in antagonist-treated rabbits. In addition, rabbits treated with the antagonist exhibited a significant reduction in ESR (Fig. 8⇓), a clinical measurement that correlates with the severity of RA (48). The CXCR2 antagonist inhibits the LPS-induced increase in ESR. Two hours before and 2 h following administration of LPS (10 ng) into the right knee joint, rabbits (n = 5) received the CXCR2 antagonist (25 mg/kg) or vehicle p.o. Before the administration of compound or vehicle, and 16 h following LPS administration, blood samples were collected for measurement of ESR by the Westergren method. Data are expressed as the mean ± SD. In a chronic OVA-induced model of arthritis, the effects of continued (15-day) administration of the CXCR2 antagonist were assessed. Day-15 synovial fluid leukocyte numbers in OVA-injected knees were significantly reduced in rabbits treated with 25 or 10 mg/kg of the CXCR2 antagonist compared with rabbits treated with vehicle (Fig. 9⇓A). This reduction in leukocytes was the result of a significant decrease in neutrophils. At the higher dose of compound, monocytes and lymphocytes were significantly reduced as well (Fig. 9⇓A). 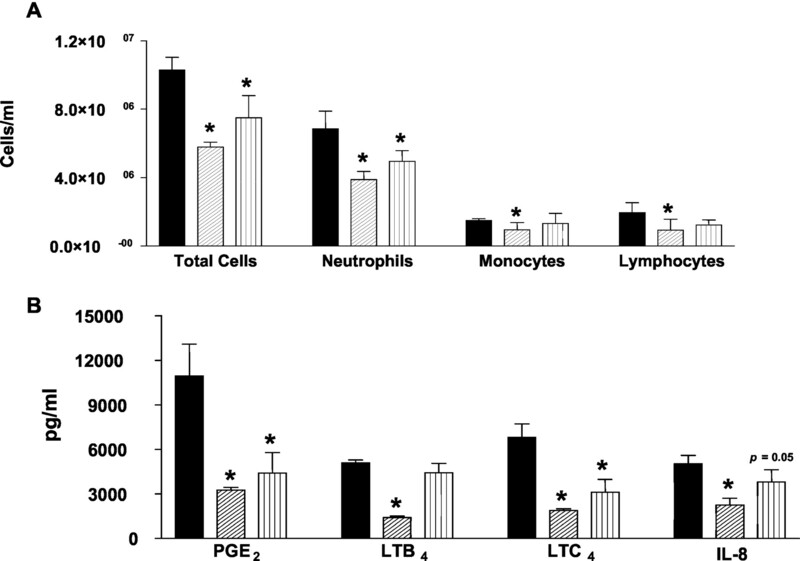 The decrease in neutrophils, monocytes, and lymphocytes resulting from treatment with 25 mg/kg of the antagonist was accompanied by a significant reduction in synovial fluid PGE2, LTB4, LTC4, and IL-8 levels (Fig. 9⇓B). PGE2 and LTC4 levels were significantly reduced by treatment with 10 mg/kg of the antagonist as well (Fig. 9⇓B). In contrast to eicosanoid and IL-8 levels, TNF-α levels were undetectable in day-15 synovial fluids. Measurement of synovial fluid TNF-α levels 6, 24, and 48 h after OVA injection into the knee showed that TNF-α levels peak at 6 h and decline thereafter (although they are still detectable at 48 h; Fig. 10⇓A, 24-h time point not shown). As seen in Fig. 10⇓A, rabbits treated with the antagonist (25 mg/kg) exhibited significantly lower 6- and 48-h synovial fluid TNF-α levels in OVA-injected knees compared with rabbits treated with vehicle. These decreases in TNF-α were accompanied by significant reductions in synovial fluid IL-8 levels (Fig. 10⇓B), as well as significant decreases in knee joint swelling (Fig. 10⇓C) and ESR (Fig. 10⇓D). The CXCR2 antagonist inhibits Ag-induced synovial fluid leukocyte, eicosanoid, and IL-8 accumulation. OVA-sensitized and -challenged rabbits (n = 5) were injected with OVA (10 mg) in the right knee joint on day 0, and administered the CXCR2 antagonist (25 mg/kg (▨) or 10 mg/kg (▥)) or vehicle (▪) p.o., b.i.d. on days 0–14. On day 15, synovial fluids were collected and differential cell analyses (A) and eicosanoid and IL-8 assays (B) performed. Data are expressed as the mean ± SD. The CXCR2 antagonist inhibits Ag-induced synovial fluid TNF-α and IL-8 accumulation, knee joint swelling, and increase in ESR. OVA-sensitized and -challenged rabbits (n = 5) were injected with OVA (10 mg) in the right knee joint on day 0, and administered the CXCR2 antagonist (25 mg/kg) (▨) or vehicle (▪) p.o., b.i.d. on day −1, and once a day on day 0 (immediately before OVA injection). Before the initiation of compound administration and 6 h following OVA injection, blood samples were collected for measurement of ESR, and knee diameters were measured. Six hours following OVA injection, synovial fluids were collected for TNF-α and IL-8 measurement. To examine the 48-h time point, the CXCR2 antagonist (25 mg/kg) (▨) or vehicle (▪) was administered p.o., b.i.d. beginning on day 0, and synovial fluids, final blood samples, etc. collected 48 h after OVA injection (at the beginning of day 2). Data are expressed as the mean ± SD. To determine whether inhibition of cell migration into the joint contributes to the in vivo effects of the CXCR2 antagonist observed, the ability of the compound to antagonize rabbit neutrophil chemotaxis induced by the ELR+ chemokines, IL-8 or GRO-β, or by the non-ELR+ neutrophil chemotactic factor, C5a (control), was determined. As shown in Fig. 11⇓, the CXCR2 antagonist inhibited human IL-8- and rat GRO-β-mediated chemotaxis with comparable IC50 values of 0.75 and 0.8 nM, respectively, but was without effect on chemotaxis induced by human C5a. These data suggest that inhibition of leukocyte migration into the arthritic joint is a likely mechanism underlying the therapeutic benefits of CXCR2 antagonism in joint inflammation. Effect of the CXCR2 antagonist on human IL-8-, rat GROβ-, or human C5a-induced rabbit neutrophil chemotaxis. Chemotaxis was measured in modified 48-well Boyden chambers as described in Materials and Methods. The effect of the CXCR2 antagonist on chemotaxis induced by 10 nM IL-8 (•), 100 nM GRO-β (▪), or 100 nM C5a (▴) was evaluated with rabbit neutrophils. Results are expressed as a percentage of control cells responding to their respective ligands in the absence of antagonist. Each point represents an average of three determinations from individual rabbits ± SEM. 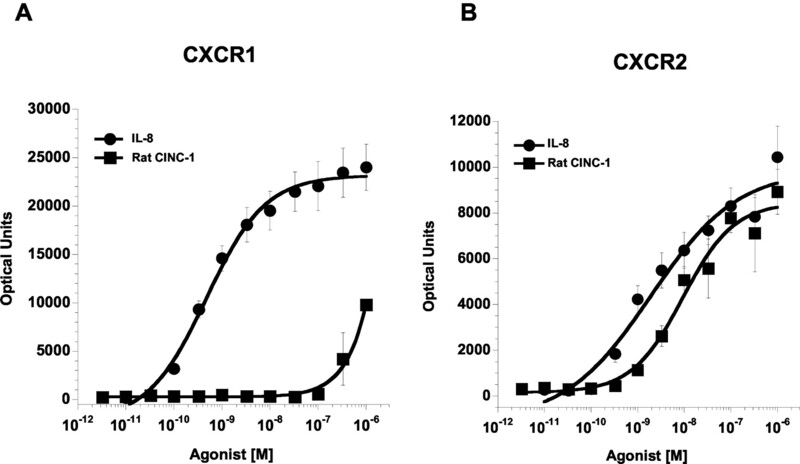 The studies described above demonstrate that a potent and selective nonpeptide antagonist of human CXCR2 inhibits multiple models of RA in the rabbit. Similar to its selectivity for human CXCR2, the antagonist potently inhibited ligand binding to, and calcium mobilization mediated by, rCXCR2, but not rCXCR1. This suggests that antagonism of CXCR2 alone is sufficient to modulate disease. The fact that the antagonist inhibited joint inflammation induced by human IL-8, which binds with high affinity to both human (6) and rCXCR2 (22), suggests that the antagonist exerts its effects in this model, at least initially, by preventing the interaction between human IL-8 and rCXCR2. Specifically, the reduction in synovial fluid leukocyte numbers exhibited by antagonist-treated rabbits is likely due to inhibition of leukocyte migration into the knee joint, consistent with the ability of the CXCR2 antagonist to inhibit human IL-8-induced rabbit neutrophil chemotaxis in vitro. In the LPS- and OVA-induced arthritis models, it is likely that the CXCR2 antagonist reduced synovial fluid leukocyte numbers by a similar mechanism, with the initial inflammatory stimulus (LPS or Ag) inducing the production of rabbit ELR+ chemokines, the chemotactic activities of which are inhibited by the antagonist. In the present study, as well as in those of other investigators (29, 49), production of synovial fluid IL-8 was induced following LPS or Ag injection, consistent with this hypothesis. Interestingly, in IL-8-, LPS-, and OVA-induced arthritis, not only were neutrophil numbers significantly reduced, but monocyte and lymphocyte numbers as well. Since CXCR2 is expressed by a number of leukocyte subsets in addition to neutrophils, including monocytes, macrophages, dendritic cells, T cells, NK cells, and basophils (50, 51, 52), it is possible that the CXCR2 antagonist directly inhibits ELR+ chemokine-induced mononuclear cell infiltration into the joint (53). Alternatively, the antagonist may directly inhibit only neutrophil chemotaxis and/or degranulation, thereby preventing the release of mediators such as defensins, CAP37/azurocidin and cathepsin G, which function as chemotactic agents for T cells and monocytes (54, 55). Consistent with the latter explanation is the fact that in each of the arthritis models described, neutrophils are the first cell type to accumulate in the synovial fluid, followed sequentially by monocytes and lymphocytes (data not shown). In addition to inhibiting leukocyte accumulation, the CXCR2 antagonist significantly reduced levels of proinflammatory mediators in the synovial fluid, including TNF-α, IL-8, PGE2, LTB4, and LTC4. This reduction may be an indirect effect, accounted for entirely by a reduction in the number of activated leukocytes in the joint as a result of reduced leukocyte chemotaxis to the site of inflammation. This explanation assumes that the cells are activated to secrete proinflammatory mediators as they enter the joint, or become activated by non-ELR+ molecules once they have reached the joint. Alternatively, or in addition, the CXCR2 antagonist may exert a direct inhibitory effect on leukocyte and/or synoviocyte production of proinflammatory mediators. Such a direct effect assumes that binding of IL-8, or one of the other ELR+ chemokines, to CXCR2 induces the production of proinflammatory mediators, or induces the expression of a molecule that stimulates mediator production. In this regard, IL-8 has been shown to induce the production of LTB4 and LTC4 by neutrophils and IL-3-treated basophils, respectively (56, 57). In addition, IL-8 has been reported to enhance the expression of cyclooxygenase-2, which catalyzes the formation of PGs such as PGE2, by LPS-stimulated neutrophils (58), and to act in an autocrine fashion, inducing monocyte IL-8 production (59, 60). The reduction in synovial fluid TNF-α levels by the CXCR2 antagonist is particularly intriguing, given the recent emergence of TNF-α antagonists for the treatment of RA (61, 62). Although IL-8 has been reported to induce activation of NF-κB (59), a transcription factor that mediates TNF-α gene expression (63, 64), there is no evidence to date indicating that IL-8 induces the production of TNF-α. Induction of TNF-α expression by IL-8 through mediator cascade(s) may occur, since LTB4 (inducible by IL-8) has been reported to induce TNF-α expression (65, 66). Thus, the rationale exists for a direct inhibitory effect of the CXCR2 antagonist on mediator production, although the relative contributions of inhibition of mediator expression and inhibition of leukocyte chemotaxis remain to be determined. It is of interest that the CXCR2 antagonist significantly inhibited the disease-associated increase in ESR observed in the LPS- and Ag-induced arthritis models. This elevation in ESR is the result, at least in part, of increased levels of circulating acute phase proteins, such as fibrinogen and C-reactive protein, the expression of which is induced by proinflammatory mediators such as TNF-α, IL-8, IL-6, and IL-1 (67, 68). This suggests that the reduction in mediator levels in the blood may be the mechanism by which the CXCR2 antagonist modulates ESR. Consistent with this hypothesis are the observed increases in serum TNF-α and IL-8 levels concomitant with the elevation in ESR in the LPS-induced arthritis model, similar to what has been documented in human RA (8, 69), and the reduction in these mediator levels as a result of treatment with the antagonist. In contrast to a reagent that neutralizes the activity of a single chemokine, the antagonist of a multiligand receptor, such as CXCR2, inhibits the activity of all chemokines acting through that receptor, and thus may induce more profound biological effects than the inhibitor of a single chemokine. To date, the majority of studies examining the effects of antagonism or targeted gene deletion of CXCR2 have been performed in mice, in which a homolog of human CXCR2, but not CXCR1, has been identified (70). McColl and Clark-Lewis (71) demonstrated that two human CXCR2-selective antagonists, GRO-α(8-73) and platelet factor-4(9-70) (72), prevent macrophage inflammatory protein (MIP)-2-induced neutrophil recruitment to s.c. tissue and/or the peritoneal cavity in the mouse. The specificity of the antagonists for human CXCR2, combined with the fact that MIP-2 is a high-affinity ligand for murine CXCR2 (70, 73), suggests that GRO-α(8-73) and platelet factor-4(9-70) inhibited neutrophil influx via antagonism of murine CXCR2. This is consistent with the observed effects of our CXCR2 antagonist in human IL-8-induced joint inflammation in the rabbit. Also similar to the rabbit studies is the fact that GRO-α(8-73) and anti-murine CXCR2 IgG were shown to effectively inhibit neutrophil recruitment induced by proinflammatory stimuli not known to act directly through CXCR2, such as LPS and Ag (OVA), respectively (71, 74), supporting the notion that neutrophil recruitment by such stimuli is mediated, at least in part, via production of CXCR2 agonists. In mice failing to express murine CXCR2 as a result of targeted gene deletion, a similar deficiency in neutrophil migration in vivo has been observed in response to various stimuli, including thioglycollate, monosodium urate crystals, wound induction, and E. coli-induced urinary tract infection (75, 76, 77, 78). In vitro, neutrophils from receptor-deficient mice exhibited defective calcium mobilization and chemotactic responses following stimulation with the murine CXCR2 ligands, MIP-2, keratinocyte-derived chemokine, and human IL-8, but not the unrelated chemoattractant, formyl-Met-Leu-Phe (70, 75). A more unexpected result was the accumulation of neutrophils and B cells in the lymph nodes, spleen, bone marrow, and blood of the mice, which has been attributed in part to CXCR2-mediated negative regulation of myeloid progenitor cells (79). 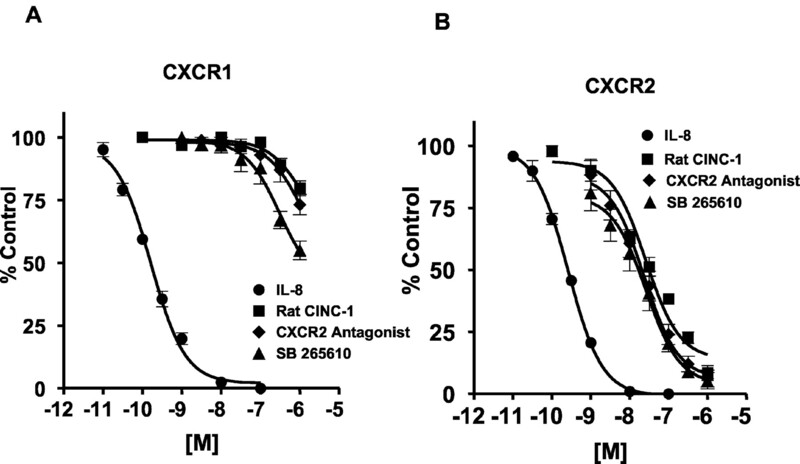 Although the lack of neutrophil signaling and chemotactic activity observed in murine CXCR2-deficient mice are consistent with the effects of our CXCR2 antagonist in the rabbit, several fundamental differences between the two systems should be considered. Unlike targeted gene deletion in mice, antagonist administration to adult rabbits or humans does not result in the lack of functional CXCR2 during embryonic development. In addition, in contrast to the expression CXCR1 and CXCR2 in rabbits and humans, mice express a homolog of human CXCR2 only (70). Thus, the relevance of observations made in CXCR2-deficient mice to the therapeutic utility of a CXCR2 antagonist in man is unclear. In this regard, it is of interest that the transepithelial neutrophil migration during E. coli-induced urinary tract infection in mice was shown to be mediated via murine CXCR2, while neutrophil migration across E. coli-infected human uroepithelial cell layers was mediated primarily via human CXCR1 (78). This suggests that in species expressing both CXCR1 and CXCR2, antagonism of a single receptor type may allow differentiation of functions mediated by murine CXCR2 in the mouse. In summary, the present study demonstrates that a potent and selective nonpeptide antagonist of human and rCXCR2 exhibits significant anti-inflammatory effects in acute and chronic models of arthritis in the rabbit. These data suggest that CXCR2 antagonism is a promising therapeutic approach in the treatment of RA, and potentially other inflammatory diseases. We thank Yanwen Qian, Pamela Souder, and Lorrie Day for technical assistance in the measurement of blood concentrations of the antagonist. ↵1 This work was supported in part by Grants HL30542, HL51072, HL6995 from the National Institutes of Health, and by the Medical Research Service of Department of Veterans Affairs. ↵3 Abbreviations used in this paper: ELR, glutamic acid-leucine-arginine; GRO, growth-related oncogene; ENA-78, epithelial cell-derived neutrophil-activating peptide-78; RA, rheumatoid arthritis; BHK, baby hamster kidney; p.o., by mouth; b.i.d., twice a day; ESR, erythrocyte sedimentation rate; rCXCR, rabbit CXCR; CINC, cytokine-induced neutrophil chemoattractant; PEG, polyethylene glycol; LT, leukotriene; MIP, macrophage inflammatory protein; 125I-IL-8, 125I-labeled IL-8; 125I-human IL-8, 125I-labeled human IL-8. Johnson, M. C. II, R. B. Goodman, O. Kajikawa, V. A. Wong, S. M. Mongovin, and T. R. Martin. 1994. Cloning of two rabbit GRO homologues and their expression in alveolar macrophages. Gene 151:337. Sarau, H. M., K. L. Widdowson, M. R. Palovich, J. R. White, D. C. Underwood, D. E. Griswold. 2001. Interleukin-8 receptor (CXCR2) antagonists. T. T. Hansel, and P. J. Barnes, eds. In New Drugs for Asthma, Allergy and COPD Vol. 31: 293 Karger, Basel.